Please note that we cannot accommodate children under TWO years of age. The kita telephone number is not published here. If you happen to find it somewhere, please do not use it. Our teachers are focused on teaching. We are located a short block from Falkplatz / Max Schmelling Halle. Mauerpark and many playgrounds are nearby. The kindergarten is a 10 minute walk from S8/S41/S42/U2 – Schönhauser Allee or 8 minute walk from the U2/M1/M10 Eberswalder Straße. Finding a parking space to drop your kid off is generally not a problem since the introduction of zoned (metered) parking. We look forward to meeting you, but please don’t stop by unannounced. We're more than happy to recieve donations. 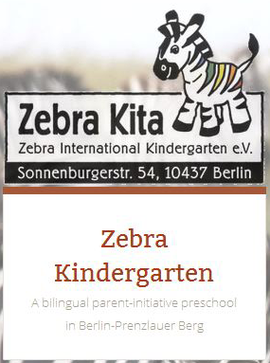 Account owner: Zebra International Kindergarten e.V. Don't forget to include your name, address as well as remittance date and the amount of the donation.